For the second year in a row, Blackstone Waterhouse is proud to announce that two of our own have been shortlisted for one of the Australian legal industry’s most prestigious awards. Danny Arraj has been shortlisted as a finalist for Partner of the Year in the Environment and Planning category, and Veno Panicker has been shortlisted as a finalist for Partner of the Year in the Construction & Infrastructure category at the 2019 Australian Law Awards, hosted by Lawyers Weekly. The Lawyers Weekly Partner of the Year Awards, in partnership with Taylor Root, showcases outstanding performance by partners, or partner equivalent, across individual practice areas within the Australian legal industry—the only national awards program to do so. The finalist list, which was announced on Tuesday, 9 April, features over 190 high-achieving partners across 29 categories. ‘Lawyers Weekly’s Partner of the Year Awards recognises those at the top of their game, showcasing the achievements of leaders going above and beyond for their firm, clients and the community at large,’ said Lawyers Weekly editor Emma Ryan. 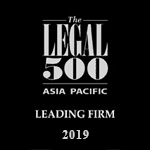 ‘Blackstone Waterhouse’ recognition for its excellent contribution to the legal industry reinforces the strength of the brand in connecting with the community and engaging with its customers,’ she added. Danny Arraj, Managing Partner at Blackstone Waterhouse said that he was humbled to be recognised among Australia’s best partners and proud to be a part of such an exclusive network. Read more about Danny Arraj here, and Veno Panicker here.